Sadly, it seems Ike's Place neighbor Daimaru Sushi might be another victim of the sandwich shop's wild success. The fuzz got Jimmy Hoffa on tax evasion and they got Ike's on a permit violation. The San Francisco sandwich shop with a cult following it turns out was not meant to be a sandwich shop at all. 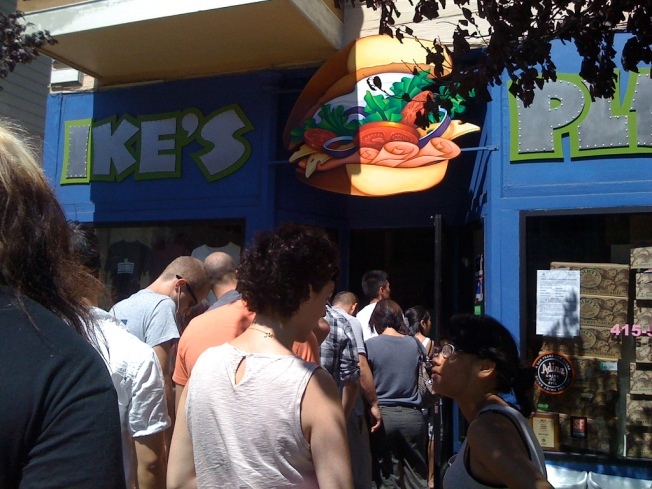 After months of trying to appease angry neighbors, court dates and landlord warnings, Ike's Place has been evicted from its San Francisco storefront. The San Francisco County Sheriff's Office is scheduled to enforce the eviction on Aug. 26 after a judge signed the order this week, according to SF Gate. Owner Ike Shehadeh's got serious earlier this year when neighbors complained to his landlord about long lines, trash, noise and the smell of the food. Ike was eventually evicted by his landlord despite his attempts to appease his neighbors by reducing hours and hiring line monitors. The restaurant had been hoping for a reprieve from the judge to operate for just a little longer before voluntarily closing shop. But the City told the Chronicle that Shehadeh was originally given a permit to operate a coffee shop at the location and not a restaurant. Ultimately one of the City's most popular foodie destinations was done in on a technicality.